Gemini November 2017 Horoscope foretells that the Northern sector of the horoscope will become dominant. The House of Career is more powerful than the House of Family in November 2017. Career planets Uranus and Neptune are in forward motion. Professional growth for the Gemini zodiac is more important than domestic and emotional matters. The November 2017 zodiac predictions forecast that majority of the planets for the Twins are in the extreme West of your birth chart. You have to cater to the interests of other people. Your own ambitions have to be curbed for the time being as Mercury is not favorable. You have to allow things to happen naturally and accept the results. Social grace will help you to achieve your targets in November month of 2017. 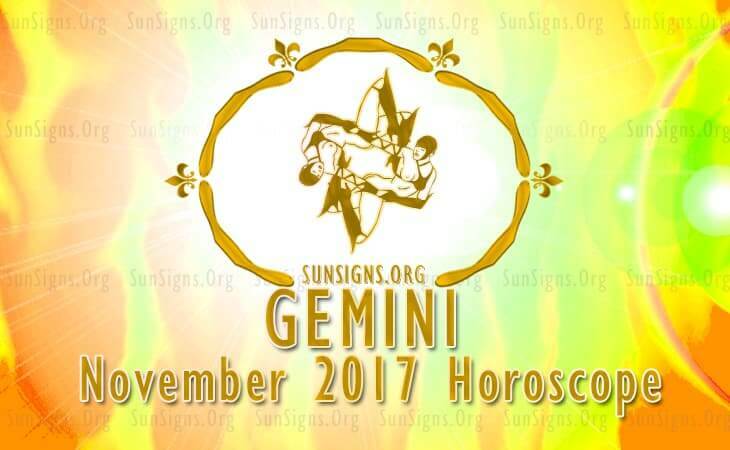 The horoscope 2017 predicts that November 2017 is suitable for implementing the Gemini career plans. Your belief in professional growth is unflinching. The influence of Mercury will help you to get a more profitable job or business with better returns. But career growth will be accompanied by some turbulence. Gemini, family and friends will provide you with new career prospects in November 2017. If you are seeking employment, you will be presented with plenty of openings. Get your 2017 Rashifal prediction. The November 2017 monthly astrology predicts that the Gemini financial prosperity will be excellent after the 13th. You will spend money on personal luxuries. While executing monetary projects, profitability will be the main factor for the Gemini natives in November 2017. The Gemini love horoscope for November 2017 foretells that your social life is quite active and this will help you in forming love relationships. Your personal charm is very good and you are admired by your family and friends for your social networking. Gemini, there will be a major shift in your requirements in love in November 2017. You are looking for a partner who will take care of your needs while at the same time you will also look after your partner’s desires. There will be more passion and bliss in your relationship with your partner in November 2017. Pregnancy related news too can be expected. Read more about Gemini compatibility. The November 2017 horoscope for the Gemini zodiac sign forecasts that health will be wonderful till the 22nd. Your awareness about health problems will help you to maintain your fitness. Include food like basil, onions, olives and cinnamon in your diet. The November 2017 Gemini horoscope predicts that career will be good but you will be dependent on others in order to fulfill your goals.